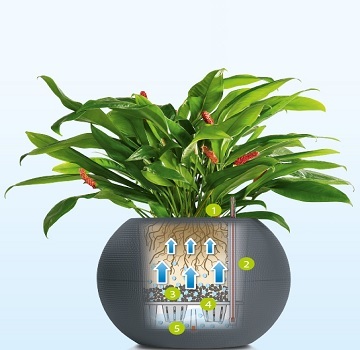 Maintaining your indoor plants is easy with Indoor Gardens’ sub-irrigated indoor planters. At Indoor Gardens, all of our plants are installed using either Mona Sub-Irrigation or Lechuza Sub-Irrigation Technology. What is a Sub-Irrigation System? Sub-Irrigation Systems enable plants to be watered from underneath the roots via a refillable reservoir thus maintaining your indoor plant. 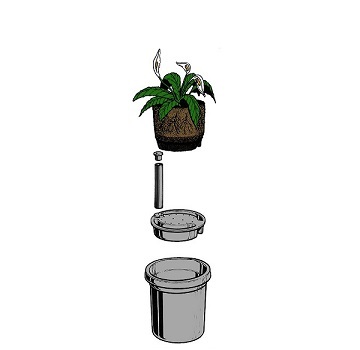 Watering from the top of a plant causes water waste due to evaporation. It can also lead to over watering, which can cause plants to become unhealthy. Sub-Irrigation lets a plant take what it requires through the capillary action created when the wick in the middle of the sub-irrigation system is filled with peat and the root ball of the plant is placed 50-60mm from the top of the capillary cone.